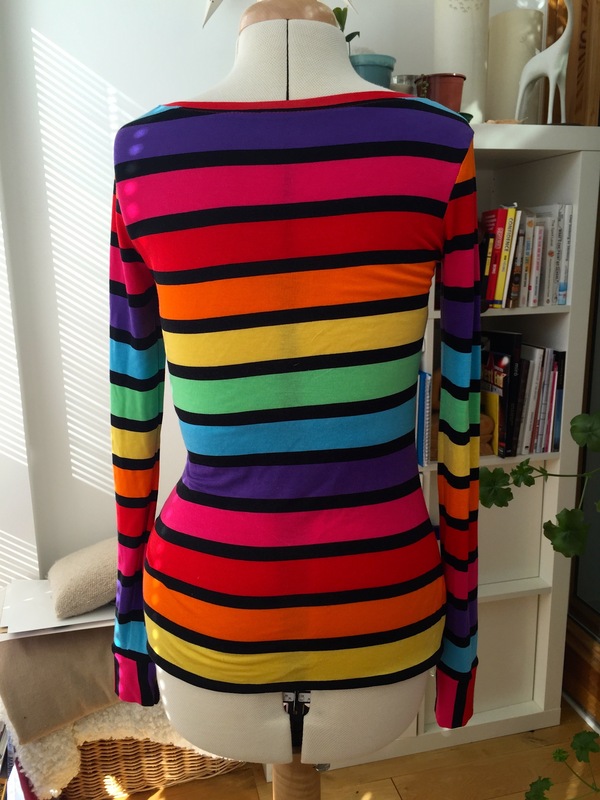 Comfy, stretchy jersey top? Don’t mind if I do! This is an Agnes from Tilly and the Buttons. She is my 4th T&TB pattern. I also had a go at a Miette skirt in denim (worn loads- definite wardrobe staple) and the Bettine dress (mine is a wearable toile- I find it a bit short but good pattern). There is also a not-far-off finished Coco lurking in my unfinished projects- can’t even say why it isn’t done…it just isn’t. I bought a couple of metres of this ridiculously bright jersey from Mandors in Glasgow a while back- it was a complete spur of the moment and has since sat in my stash. It’s a fairly lightweight (probably viscose) jersey with a lot of stretch. It only cost a few pounds so I thought it would be a good test bed for an Agnes and not a disaster if she was a disaster. 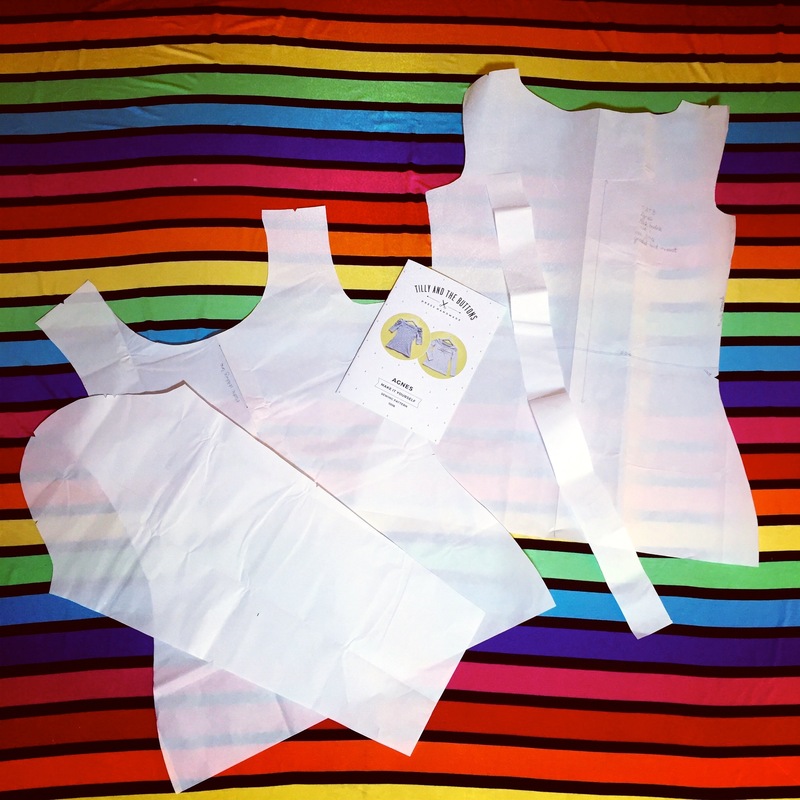 I graded the pattern from a size 3 at the bust to a 4 at the hips and cut full pattern pieces for the front and back. 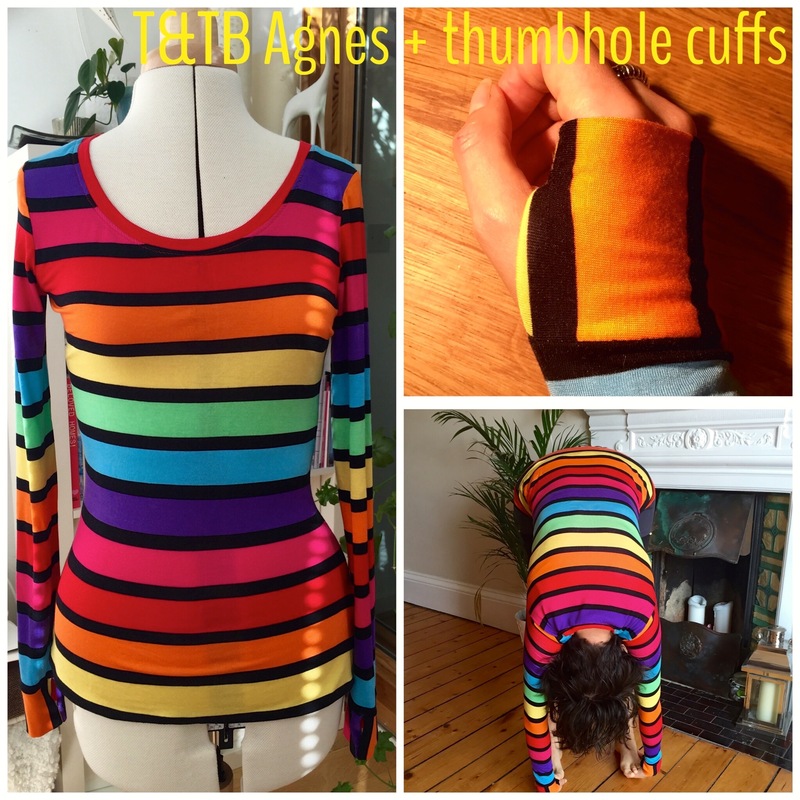 I wanted to make a more sporty Agnes to use for yoga and love a top with thumbhole cuffs so added those too. 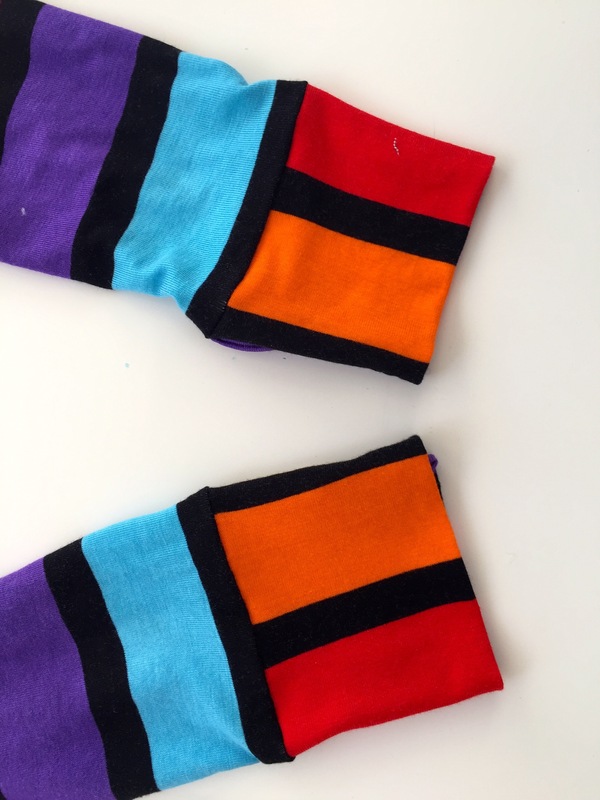 Stripes + a stretchy knit = careful stripe matching. 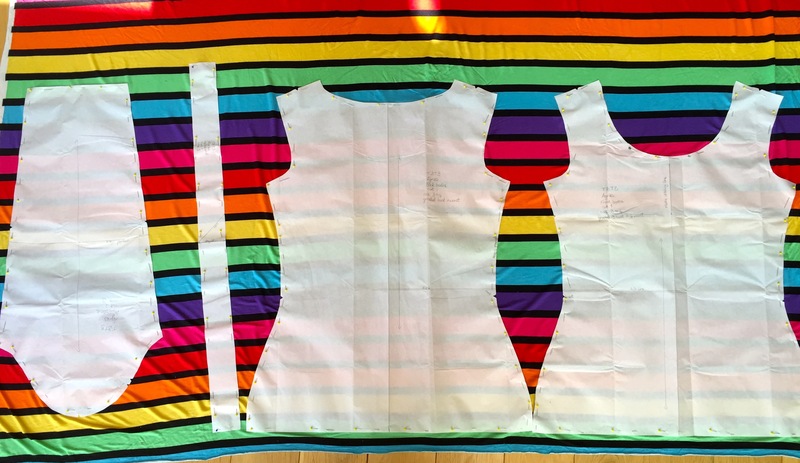 I measured the end point for the bottom edge of the front, back and sleeves to make sure they all matched. 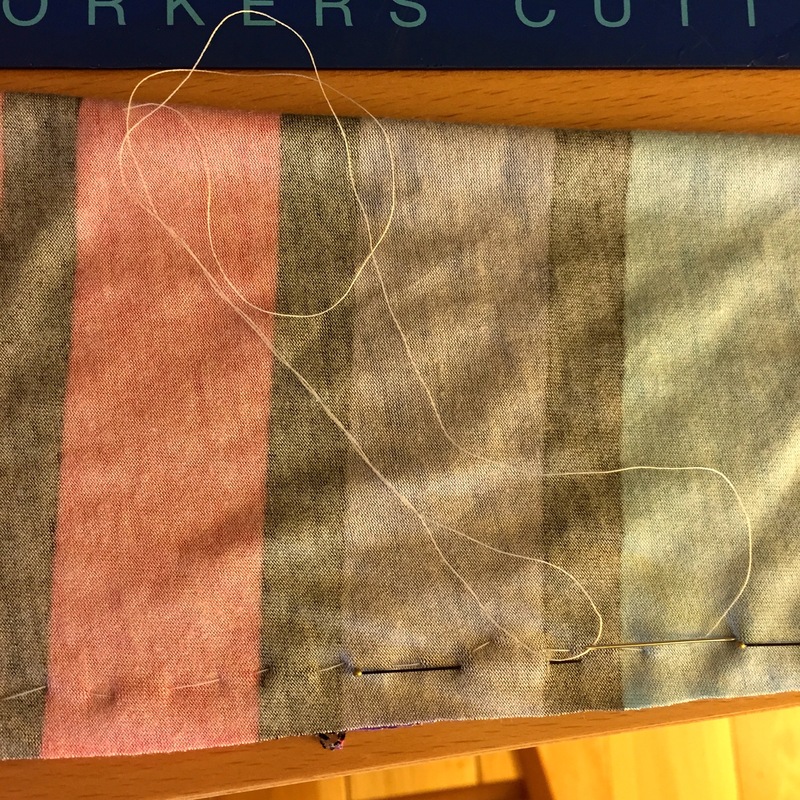 The first neckband (not the final one) was cut vertically so the stripes would sit in a different direction (as suggested in the pattern). 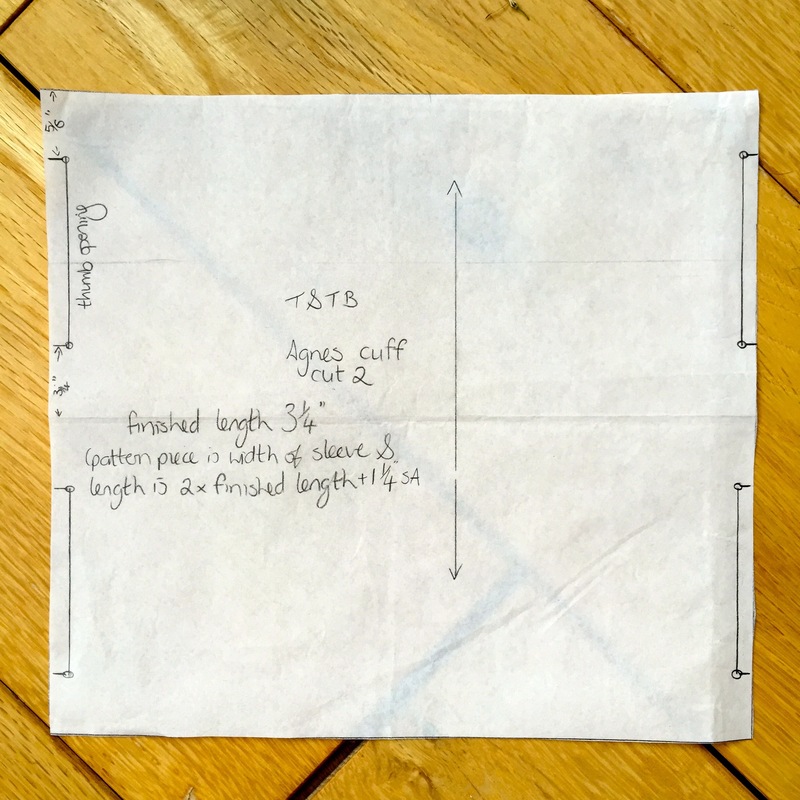 To make the cuffs I worked out how long I wanted them to be (knuckle grazing is where I like them so 3 and 1/4″ + SA), doubled this up for folding and cut pattern pieces which were 6 and 1/2″ long and the same width as the sleeve. I added markings for the size of the finished thumbhole ( I like 1.5-2″). I had the opening start 3/4″ before the end of the cuff and it finished at the SA (5/8″) before the top of the cuff. 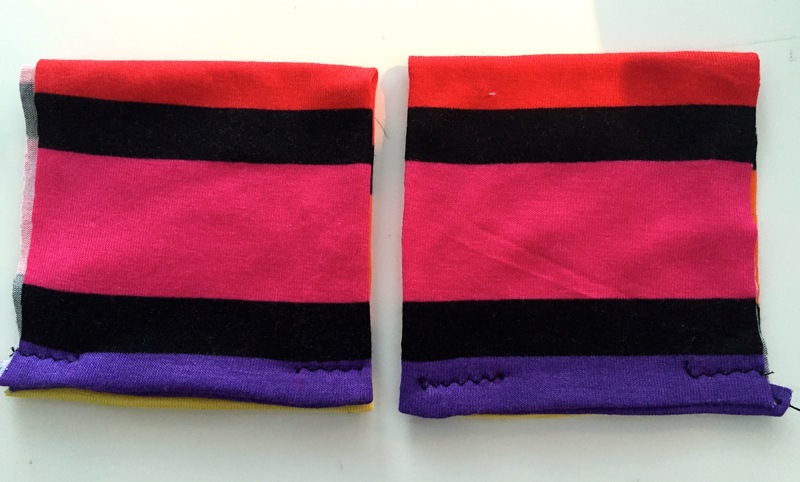 I cut the cuff pieces so the stripes would run vertically at the end of the sleeve. I also starched all the pieces before starting to sew to try to make the fabric a bit more stable. 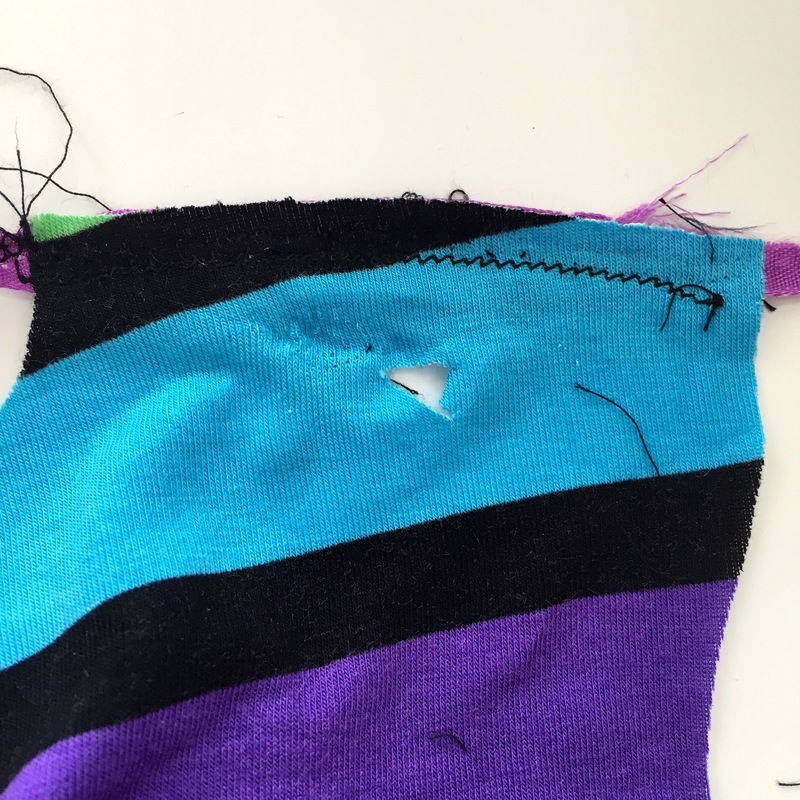 I did start using the overlocker to construct the top (I used ribbon to stabilise the shoulder seams first) and promptly had a disaster…. So back number 2 was cut (that’s when you’re pleased to have excess fabric), I put the overlocker to the side and carried on with the sewing machine. The top came together easily although the neckband took me 4 attempts. I think it was because there was so much stretch in the jersey I used. 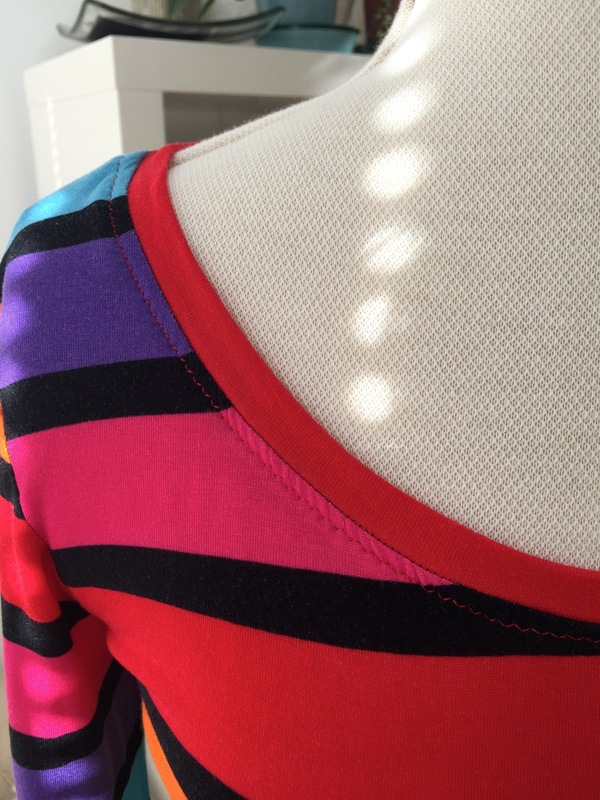 I also didn’t like the stripe colour placement on the original neckband I cut after I had removed a good chunk of the length so I cut a second neckband just using a red stripe. I ended up reducing the original length of the neckband by around 20% overall to get it to lie flat but it was absolutely worth all the pinning, unpinning and re-pinning because I’m really happy with the end result. I top stitched in red thread which is ok- not sure which colour would be a better choice given the range in the fabric. I did play with adding ruching but didn’t like it with the wide stripes. 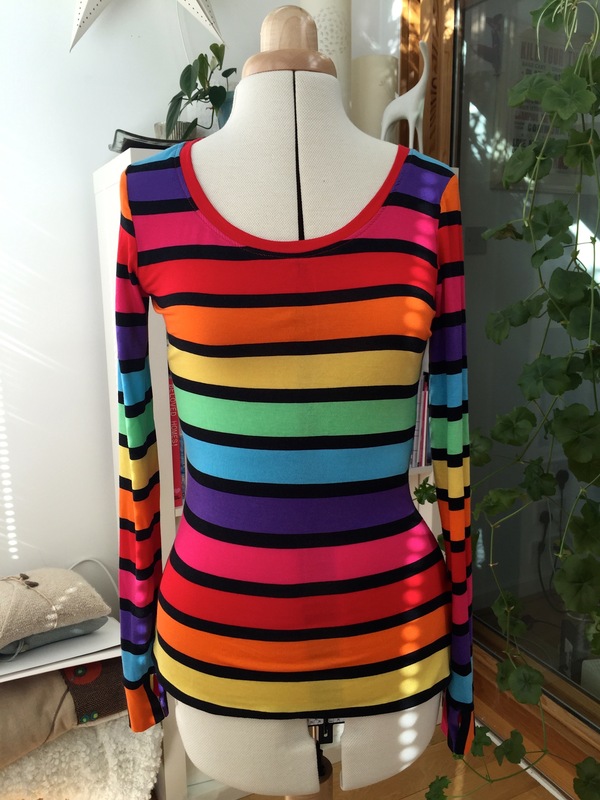 I hand basted the side seams and arm seams before stitching to get the stripes to match and so I could try it on to check the overall fit before sewing them up. 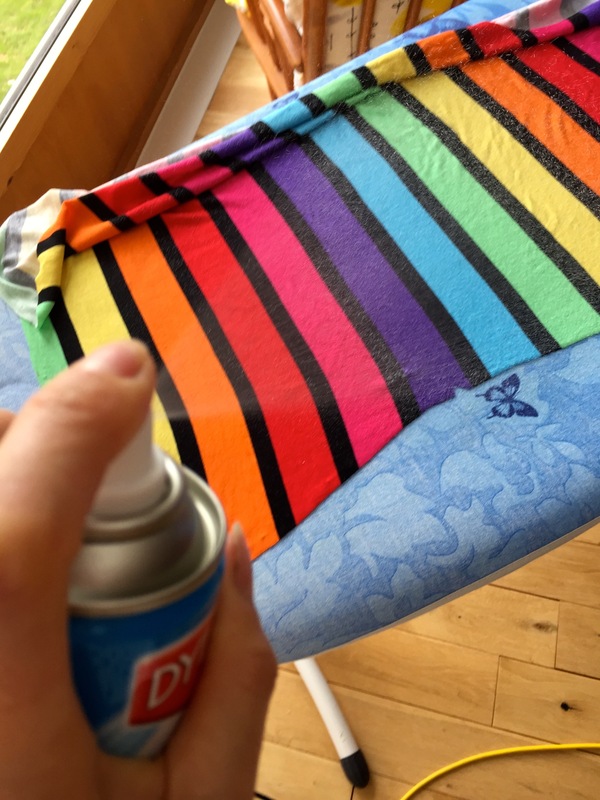 I find I get a much more accurate result when matching stripes than I do with pinning alone. 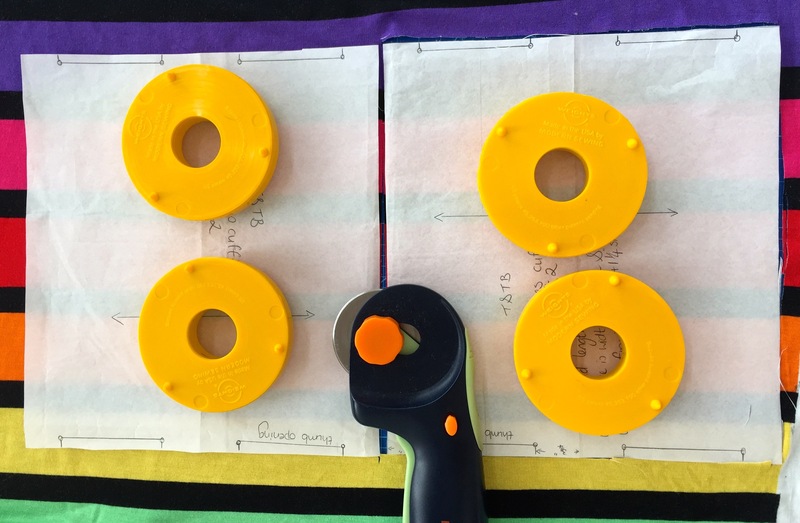 The cuff construction steps I used were (there may be a better way, I just made this up based on what I wanted)…. 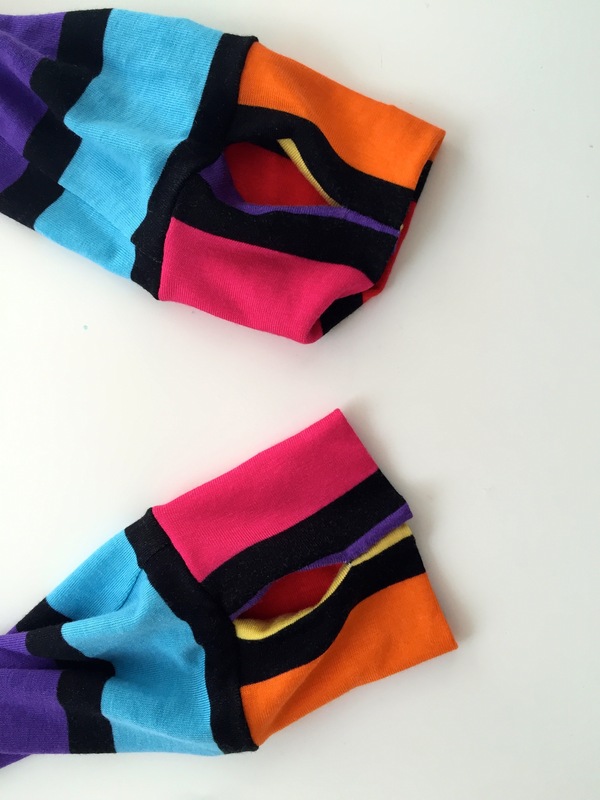 Fold right sides of cuff pieces together and sew each short edge together with a 1/4″ SA. Press if needed and turn to right side,make sure corners are fully pulled out. It should look like this (this pic is from a self-drafted slouchy tee I made with shaped thumb hole cuffs because I forgot to take a pic in the Agnes fabric). 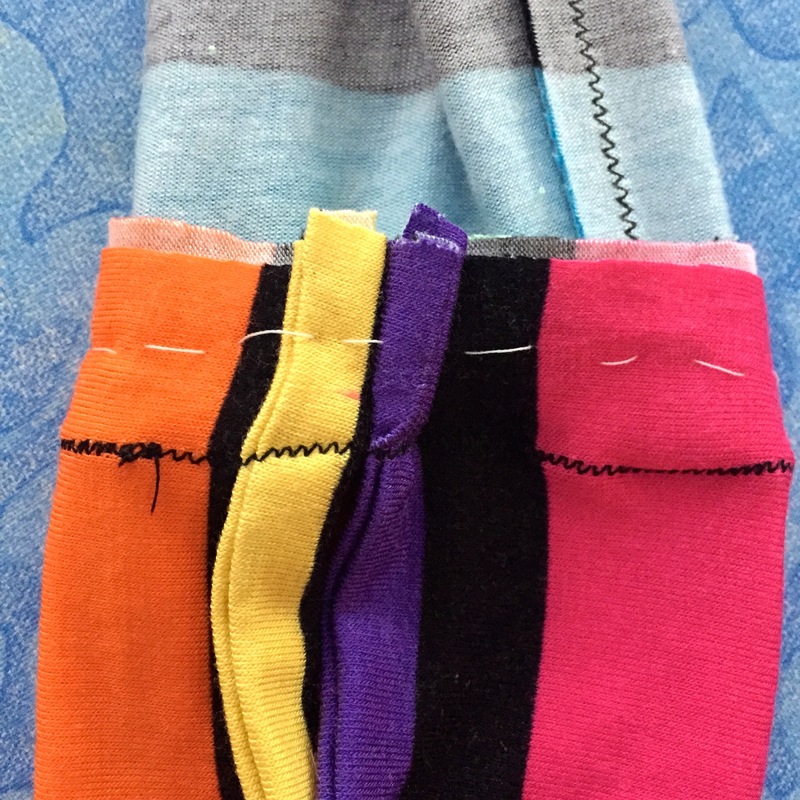 Fold the cuff pieces short sides together with right sides together and mark the thumbhole opening with pins and stitch. Pin and sew either side of thumbhole to either end of cuff and turn right side out. 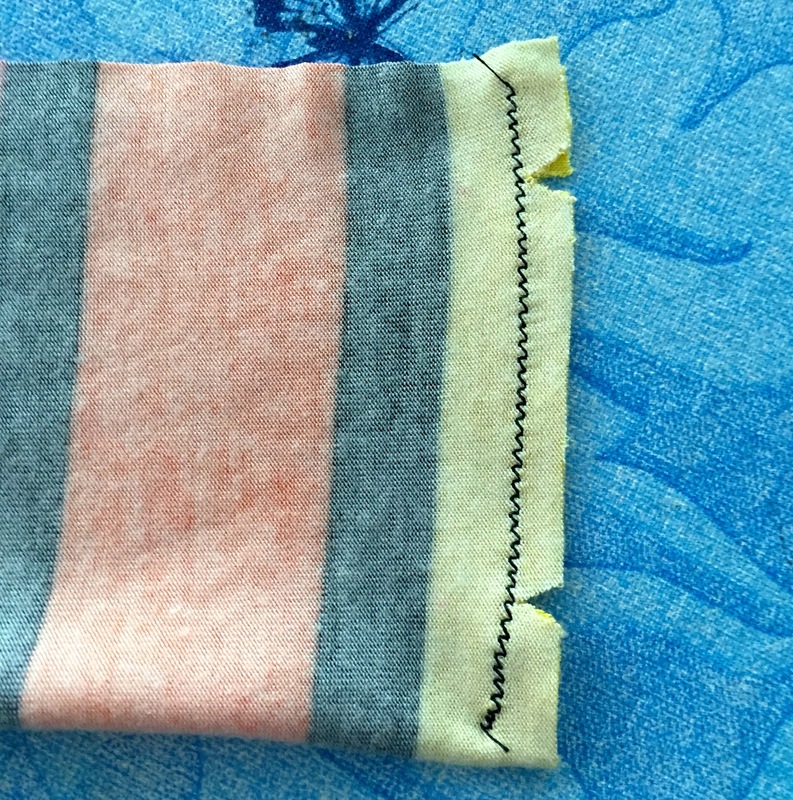 Place the cuff over the end of the sleeve, right sides together, matching raw edges. 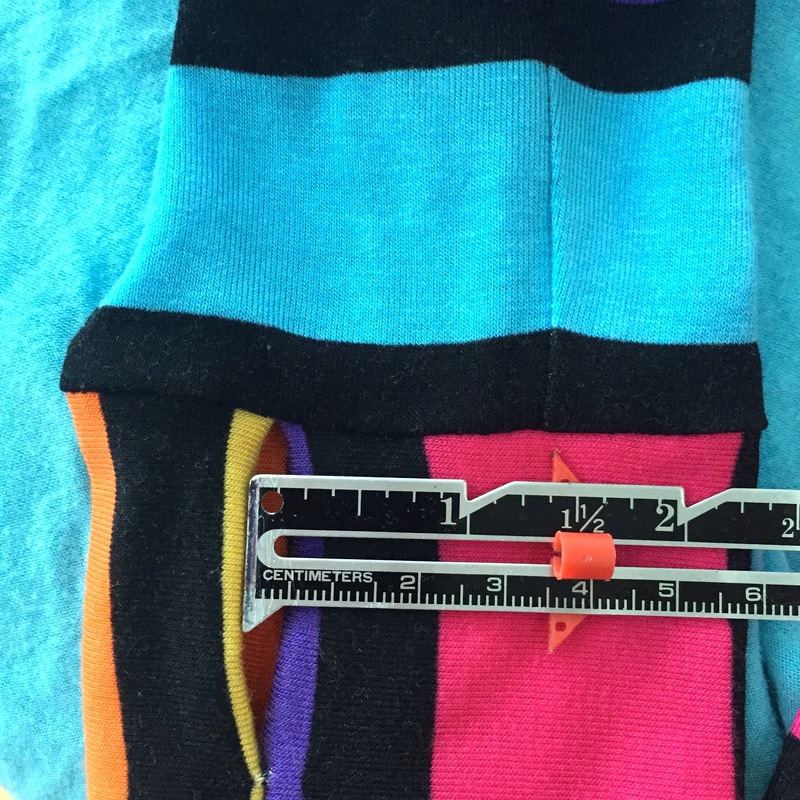 I placed the thumbhole opening 1.5″ to the thumb-side of the sleeve seam (1.5″ to the left on the left sleeve and the same to the right on the right sleeve). I hand basted the cuffs in place because I wanted each side to be as close to exactly the same as possible then stitched them on with the usual 5/8″ SA. Lovely thumb hole cuffs- done! All that was left to do was hem it. 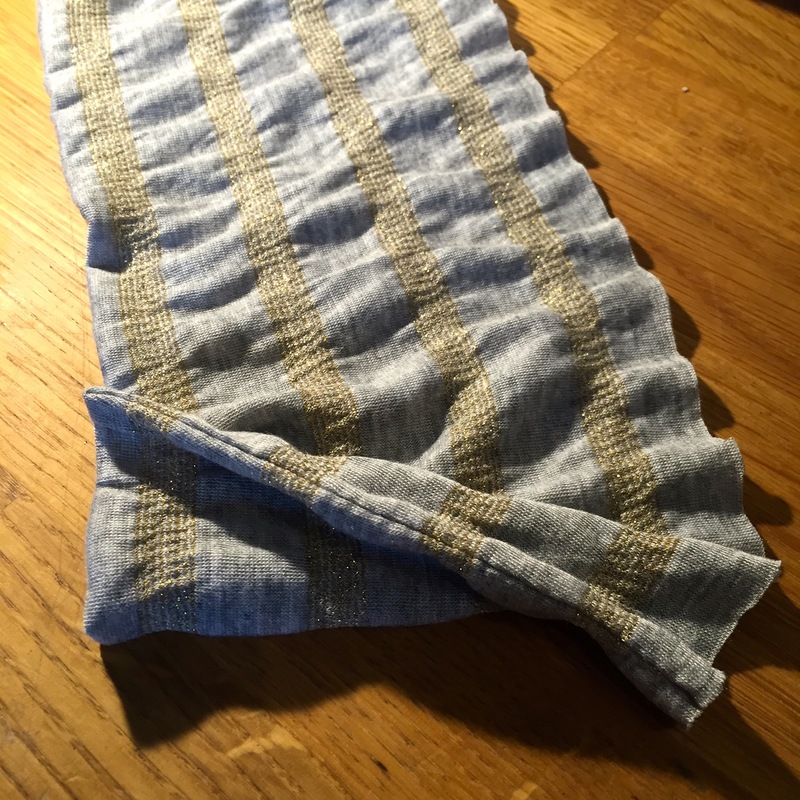 I overlocked the bottom edge, added a narrow strip of knit fusible interfacing (should have done that before overlocking but forgot) and then turned it up and stitched using a ballpoint twin needle. 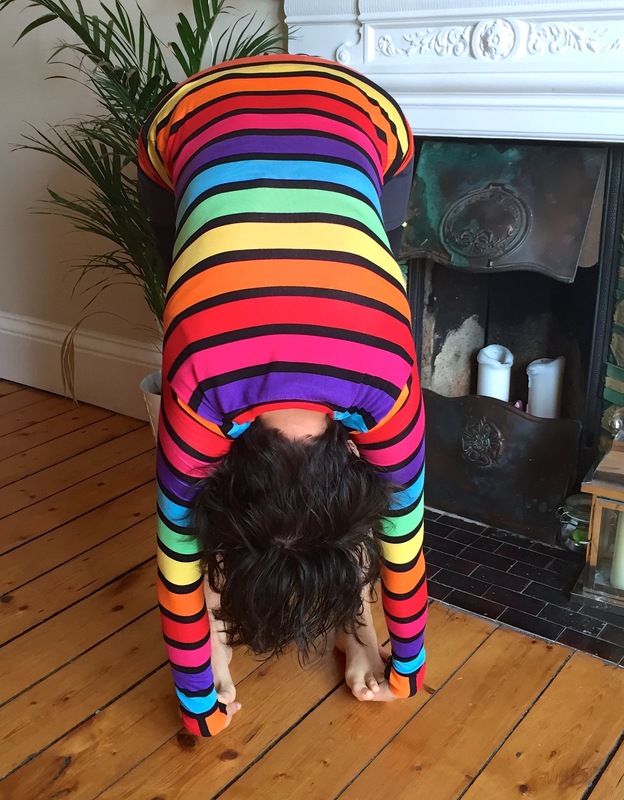 I like the fit and it stays put- even when I’m in upside down poses :-). I can also report I have since made up with my overlocker too!